A trailer has been released for ‘John Wick: Chapter 3 – Parabellum’, the next instalment of the film franchise. Its main protagonist, Keanu Reeves, is back in his original role as seen in the preview. The trailer for ‘John Wick: Chapter 3 – Parabellum’ opens with a follow-up from the previous instalment. Indeed, Keanu Reeves, who portrays a famous hitman, has been banned from The Continental. His character is now on the run and has to escape New York City. 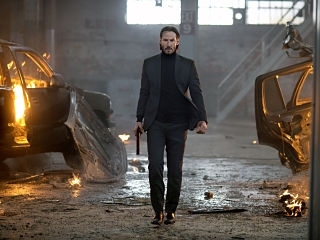 Launched in 2014, the franchise which includes ‘John Wick: Chapter 3 – Parabellum’ was created by Derek Kolstad. The upcoming movie will be centred on Keanu Reeves’ character once again as he now has a price on his head. He will get help from a friend, Sophia (Halle Berry), in order to get out of the situation alive. Alongside Keanu Reeves, there are quite a few actors reprising their roles in ‘John Wick: Chapter 3 – Parabellum’. Laurence Fishburne, Ian McShane, and Lance Reddick are back as The Bowery King, Winston and Charon respectively. Some of the new recruits include Angelica Huston, Asia Kate Dillon as well as Mark Dacascos and Saïd Taghmaoui. Expected in theatres in May 17, 2019, ‘John Wick: Chapter 3 – Parabellum’ could be one of the biggest earners for Keanu Reeves. The flick might cost more than $231 million internationally. It will premiere around the same time as ‘Aladdin’ and ‘Detective Pikachu’.